Is January the month of the M.U.S.C.L.E. lot? 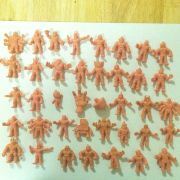 While eBay has seen an increase, and is currently plagued with, a large number of over-priced, misrepresentative single M.U.S.C.L.E. 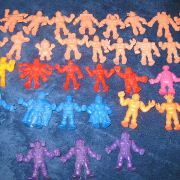 figure auctions there is simply a huge amount of M.U.S.C.L.E. lots. Is it the cold weather? Are people making room for their new holiday purchases? Are people trying to pay off holiday bills? 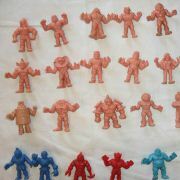 Who knows why eBay is filled with M.U.S.C.L.E. lots? Among the single figures and lots there is one auction that differentiates itself from the pack. 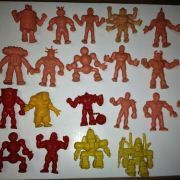 This auction, 1980’s M.U.S.C.L.E. 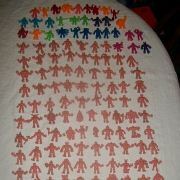 Men Vintage Toys 2 figures + Poster 1985, features a M.U.S.C.L.E. poster in pretty decent condition. 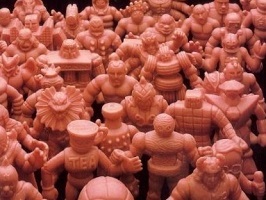 The last M.U.S.C.L.E. poster featured in Auction watch sold for $30, but the prices of these posters are certainly volatile. This poster seems to be in slightly better condition than the $30 poster. It seems likely that it will end near the somewhat average price of $40. The final price of the poster auction will be $42.50. This entry was posted on Tuesday, January 17th, 2012 and is filed under Advertising & Promotion, Auction Watch, UofM News. You can follow any responses to this entry through RSS 2.0. You can skip to the end and leave a response. Pinging is currently not allowed. 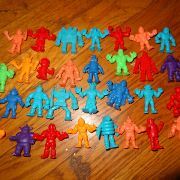 I’ve seen an increase of M.U.S.C.L.E. auctions this month too. My search brings in 900+ in Ebay. 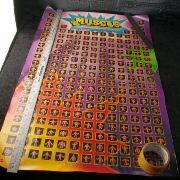 That does include other toys that use the word muscle, but on average the usual search is in 500-600 range. I think it’s the single figure auctions throwing that number off.